"It surely is a difficult situation for him but when one is a great professional like he is, and one has a good head like his, you keep training to get better day by day because he could play on a weekend. "It happened to me last year in Sampdoria. I was not playing but I was working as if I was going to play." Romero joined United this summer on a free transfer after leaving the Italian club. 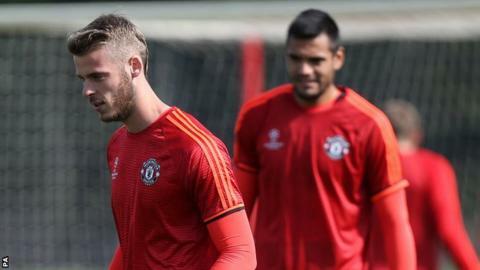 He has conceded only one goal in his three games so far - in the 3-1 Champions League play-off first-leg win over Club Brugge - and says he enjoys training alongside De Gea and another "fantastic" Spanish goalkeeper, 33-year-old Victor Valdes. "One has won everything and the other has his career ahead of him to continue to win things," Romero added. "For me it's a privilege and it makes me happy to work with those two."